CHICAGO — The Packers took a 17-16 lead over the Bears into the fourth quarter of Sunday’s season opener at Soldier Field. Following a 46-yard kickoff return by Ty Montgomery to begin the second half, the Packers moved across midfield and then Eddie Lacy ran for 15 yards to the Bears 31. Aaron Rodgers flipped a 25-yard completion to Davante Adams at the Bears 6-yard line. The ruling was challenged unsuccessfully by Bears Coach John Fox. 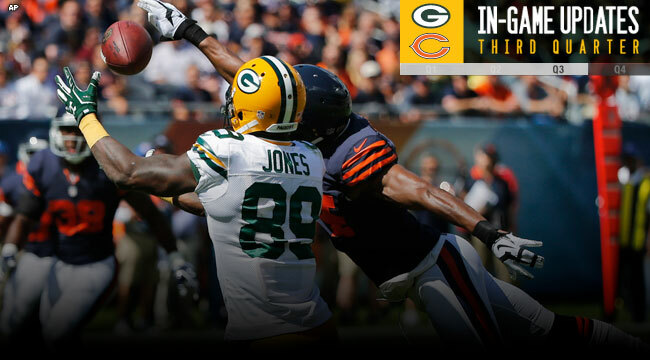 Two plays later, Rodgers threw to James Jones for a touchdown, his second of the day. The Packers led, 17-13, with 11:56 to play in the third quarter. The Bears roared back on the strength of a third-and-9 conversion pass and a 20-yard run by Matt Forte. Jay Cutler completed a 12-yard pass to Alshon Jeffery on third-and-3. From the Packers 23, the Bears were moved back 10 yards for holding. Cutler failed to see a wide-open Martellus Bennett on second down, and the Bears ran on third down to give Robbie Gould a 45-yard field goal attempt. Gould hit it, 17-16, with 4:57 to play. Late in the quarter, Rodgers converted a third-and-4 with his legs, rushing for 12 to the Bears 49. That’s where the Packers were when quarter ended.